The newly launched Paytm Payments Bank is offering 4% interest rate on savings account. Its competitor Airtel Payments Bank is giving 7.25% interest on deposits in savings accounts, while India Post Payments Bank is providing 5.5% interest on deposits depending on the amount. Paytm Payments Bank’s interest rate is in line with all the large commercial banks, including State Bank of India, Bank of Baroda and ICICI Bank Ltd, which continue to offer 4% interest rate on savings account deposits. Some of the smaller banks, including Yes Bank Ltd and RBL Bank Ltd, offer 5.5-7.1% interest rate on savings accounts, depending on the deposit amount. India Post Payments Bank is offering three kinds of accounts: one regular and two basic savings bank deposit accounts. For most payments banks, there is a cash withdrawal charge. Paytm Payments Bank’s cash withdrawal charges using the ATM is similar to any other major bank of the country. You will get five free transactions in non-metro cities and three free transactions in a metro city, after which you will be charged Rs20 for each cash withdrawal and Rs5 for non-financial transactions like taking out a mini statement. In case you need a physical statement from the bank, you will have to pay Rs50 plus delivery charges; additional service tax will also be applicable. Airtel Payments Bank will charge 0.65% of the withdrawal amount if you withdraw cash from a banking point. India Post Payments Bank will not charge any fee if you withdraw money using an ATM card at India Post Payments Bank ATM or Punjab National Bank ATM. However, for withdrawals from other bank ATMs, you will be charged as per standard Reserve Bank of India (RBI) rules—you will get five free transactions in non-metro cities and three free transactions in metro cities, after which you will be charged Rs20 for financial transactions and Rs8 for non-financial transactions. For doorstep banking, where the bank delivers cash at the customers doorstep, cash deposit and withdrawal charges range between Rs15 and Rs35, depending on the amount. Paytm Payments Bank will provide Rupay debit card to its customers at an annual subscription cost of Rs100 plus delivery charges. In case of loss of card, you will have to pay Rs100 plus delivery charges to get it replaced. The bank is also providing a cheque book at a cost of Rs100 plus delivery charges for 10 cheque leaves. India Post Payments Bank is offering free debit cards, but you will be charged Rs100 if you take add-on cards or a new card in case of theft or loss of card. Also, it charges an annual maintenance fee of Rs100 which is applicable from the second year onwards. There are also limitations in terms of withdrawal from the ATM for India Post Payments Bank—a maximum amount of Rs10,000 per transaction and a maximum amount of Rs25,000 per day—depending on the account you hold with the bank. In case the ATM kit or ATM card is returned due to wrong address, you will have to pay Rs100 as charges for the replace card to be delivered. Paytm Payments Bank will provide online fund transfer services such as Immediate Payment Service (IMPS), Unified Payment Interface (UPI) and National Electronic Fund Transfer (NEFT) free of cost. 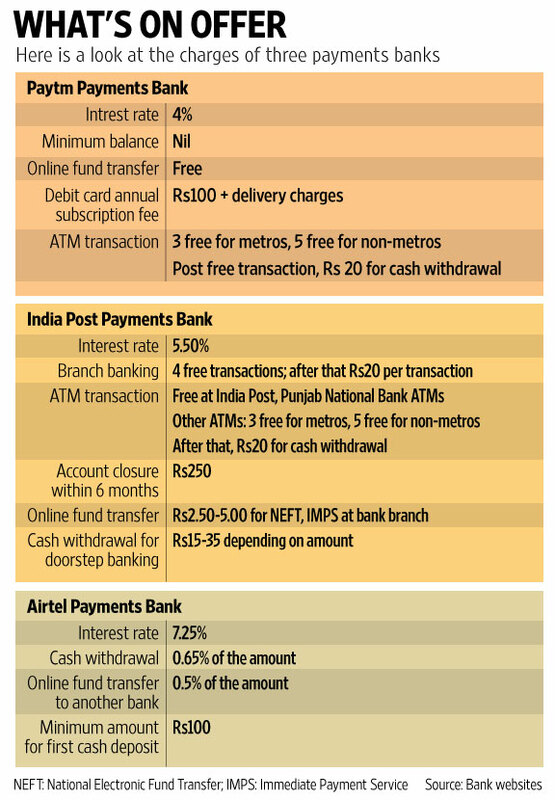 India Post Payments Bank will charge a fee if the transaction happens at the branch or as part of doorstep banking—NEFT will cost Rs2.5-5, while IMPS transaction will cost Rs5. If you do it using mobile banking, NEFT is free, but you have to pay Rs4 per transaction for IMPS. Airtel Payments Bank charges 0.5% of the transferred amount if you transfer funds from Airtel Payments Bank to another bank account through internet banking, mobile app or Unstructured Supplementary Service Data (USSD). Within the bank, fund transfer is free of cost.